Old Crow and the Vuntut Gwich’in | Above and Beyond….. This Spring I was fortunate to spend several fascinating days working in the northern Yukon community of Old Crow, about 100 miles south of the Arctic Ocean. Nearly 100 years ago, the Vuntut Gwich’in people lived a nomadic existence heavily dependent on the Porcupine Caribou herd in the Northern Yukon and Alaska. As “civilisation” took hold of the Arctic, the Vuntut Gwich’in were forced into a permanent settlement along the banks of the Porcupine River. About 300 people live in that community, now known as Old Crow. There are no roads within 100 miles and access is by air, or by boat along the Porcupine River, which meets the Yukon River downstream in Alaska. 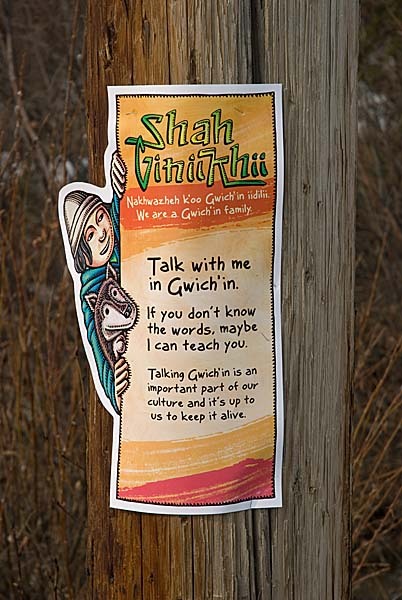 Vuntut Gwich’in life has been heavily and and at times forcibly diluted by western culture – they have endured residential schools (where children were forcibly removed from the community to be educated in western ways), alcohol and disease. Somehow they have managed to retain some of their old ways and hunting and gathering still plays a major part in their lives. They still depend on the land for their existence. Obviously this is a choice as they could default to western culture for their daily needs if they so wished (and no doubt a few do). When I arrived, the ice on the Porcupine River was weak and fractured after a week or two of warm weather. The break-up is a pivotal point in the Vuntut Gwich’in year and bets were on as to the day the river would become free of ice. These were days of celebration – soon they would be off hunting as the Porcupine Caribou herd heads northwards towards the North Slope as it has done for thousands of years. Even for those with regular jobs, taking time off for the hunt seems accepted as a birth-right. What seemed remarkable, is their integration of modern and ancient. Their lives are not “either/or”. Traditional living is part of school curriculum and there is a drive to keep their language and culture alive. Transportation is important – the fact that the Vuntut Gwich’in own a 49% share in Air North, the Yukon’s airline, is significant, and so is high speed Internet, snow mobiles and the other staples of modern life. I was also surprised to see a couple of modern community buildings decked with photo voltaic panels – set almost vertical to catch the low arctic sun. Those I met were bright and friendly and they seem to age extraordinarily well. As a colleague who had lived and worked in the community for 11 years remarked, “They hadn’t seen a vegetable in the community until about 40 years ago.” Their diet was, and still largely is, meat, fish and berries and they seem to thrive on it. I was shocked to find that I had underestimated the ages of several individuals by 20 years. Interestingly they have embraced aspects of our culture. They love playing the fiddle and square dancing – as I discovered during their “Cariboo Days” celebrations. I don’t wish to romanticise life in this rare community, as it has its problems like anywhere else. As they have learned from us, I think we have a lot to learn from them. As I departed after four wonderful days in Old Crow I couldn’t help but wish them well. To see David’s photographs of the Yukon…. Encouraging kids to learn the language and live the culture. This entry was posted in Arctic, Northern Canada, Travel and tagged Arctic, arctic ocean, ice, native culture, native history, north america, Old Crow, Porcupine Caribou, Porcupine River, tundra, Yukon by David Skelhon. Bookmark the permalink.